Tuneup – is an old-fashioned maintenance term that’s taken on a slightly new meaning today. With electronic ignition and fuel injection came computers that took over control of engine settings. Early versions allowed for some tinkering, but today’s engines require advanced equipment and training. 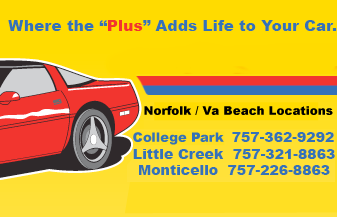 Accurate Tune Plus has been providing car tune ups in Norfolk, VA and Virginia Beach for over ten years. All spark plugs should be removed and checked every 30,000 miles – even if your car is “low maintenance” – you’re told to change spark plugs at 100,000 miles. This prevents the plugs from seizing in the block, causing expensive repairs down the road. According to experts, changing filters on a regular basis may have more to do with your car’s longevity than any other single factor. Fuel Filter: Contaminants can get into your fuel system and if not trapped by the fuel filter, they can clog the injector inlet screens. If dirt reaches the injector itself, it can clog or damage the pintle valve and seat. In older cars, dirt can plug the carburetor’s fuel metering orifices. Many maintenance parts are mistakenly seen as non-critical. Though not true “tuneup” parts, the functions of these parts can definitely impact the benefit of any tuneup. Plus, as emission laws have gotten more stringent, these parts have become essential – if you want your car to pass emissions the first time around. Oxygen Sensor (O2 Sensor): Your oxygen sensor(s) should be replaced at the recommended intervals. A worn oxygen sensor drastically changes engine settings. Vacuum Hoses: Many major systems depend on manifold vacuum for signals and function. All vacuum hoses should be checked and replaced as needed. Even a slight leak can cause major problems with performance; in some cases, the car won’t even run if there’s a vacuum leak. Tip #1: General overall cleanliness of your engine is the best preventive maintenance you can perform on your car. A clean engine runs cooler and is much less likely to cause premature failure of other parts. It’s also easier to work on. Tip #3: Know your car’s systems and particular requirements before starting any project. Do not attempt to fix what you don’t understand. Tip #4: Remember that some improvements may not take effect right away if your car’s computer is designed to learn and adjust. The computer may need to see various parameters before making any permanent setting changes.